A meeting of Japan’s new nuclear regulator Wednesday revealed that Tokyo Electric Power Co, or Tepco, owner of the wrecked Fukushima Daiichi nuclear station, has no idea what it is doing even when it comes to reporting bad news on recent radioactive water leakage at the plant. Photo: A pool photo taken during a visit of journalists to the Fukushima Daiichi plant. The new errors come at a time when Tepco is trying to overturn its reputation for dishonesty and incompetence. But new emergency level assignments for leaking water at Fukushima Daiichi suggested by the embattled company have served only to obscure how grave the leakage of irradiated water may be. It has certainly further eroded trust between the new regulator, the utility and the public, and has shrilled called from Japanese officialdom that the government dump Tepco from Fukushima clean up efforts and put them in the hands of the government. Tepco last week recommended that Japan’s Nuclear Regulatory Agency slate a 300-ton leak from a storage tank containing highly irradiated water as a Level 3 –(“serious incident” – on the seven point International Nuclear and Radiological Event Scale (INES). The move, which upgraded the spillage from a relatively irrelevant Level 1 (“anomaly”) incident was seen by many as a vote of confidence in Tepco, which has earned a reputation for ineptly handing the crisis and consistently lying the public about the gravity of the Level 7 triple meltdown at Fukushima, occasioned by a tsunami and 9.0 scale earthquake in March of 2011 – and what has been left in its wake. At a meeting of the NRA on Wednesday, the agency agreed to support the recommendation of a Level 3 rating on the INES. But NRA chairman, Shunichi Tanaka, told reporters, according to Bloomberg, that Tepco may very well be overstating the state of the emergency, and that the NRA would be considering downgrading the extent of the INES rating. According to remarks reported by the Associated Press, Tanaka went along with the reassignment of a Level 3 to the leakage because, he said : “What’s important is not the number itself but to give a basic idea about the extent of the problem. But he was quick to say he flatly did not believe Tepco’s assessment. “I’ve seen reports that this is a dire situation but that’s not true,” he was quoted as saying in the same report. The final decision on whether the Level 3 rating will stand will be taken by the International Atomic Energy Agency (IAEA). The new rating would represent the most significant change in the situation since the Fukushima accident was rated as a Level 7 on the INES scale, making it equal to the 1986 Chernobyl disaster. Burning question – Does Tepco know what it’s doing? Yet, the heated issue at Wednesday’s meeting of the NRA was the fact that Tepco really has no idea how much water it has lost from the radioactive water storage tank. “We have no idea whether it’s actually 300 tons that leaked,” Tanaka told the NRA meeting, according to the Bloomberg article. Tanaka went on to say that 300-ton loss of water reported by Tepco was based on the assumption the tank had been filled to capacity before the leak. That assumption could be flawed, said Tanaka, because none of the 1,000 tanks Tepco has trucked in to contain the inundation of water that has ad-hoc been dumped on reactors and spent fuel cooling pools to keep them cool since the disaster began, have gauges to measure their individual water levels. 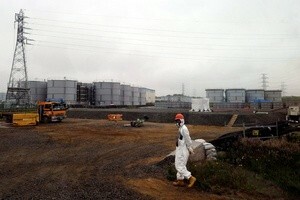 On-the-ground monitoring of the leak situation by Tepco is not confidence inspiring. According to the AP report on the NRA meeting, the regulator excoriated Tecpo over its reports that the tank leak may have sprung as far back as a month ago. According to the AP account, Tecpo officials told the NRA radioactivity near the leaky tank and exposure levels among patrolling staff started to increase in early July. Tepco further produced no evidence that anyone tried to locate the source of the radiation before the tank leak was discovered. Tepco also acknowledged that monitoring of the sprawling compound of the 1,000 tanks was left to only two workers that daily took two two-hour walks daily – without dosimeters – and that their inspection results have never been accurately recorded, according to the AP report. Tepco has said it will boost monitoring staff from two to 50, said the agency. But this offers little by way of assurance to the NRA, and its too little to late. According to the AP report, the regulatory officials vociferously complained that Tepco habitually ignored their instructions to improve the tank monitoring and patrolling process – instructions that might have caught the leak much earlier. Regulators also complained that Tepco technicians don’t have the experience to judge the impact of leaks in the first place, citing that underground water is shallower around the leaking tank than Tepco initially reported to them, said AP. “Their instructions, written or verbal, have never been observed,” Toyoshi Fuketa, an NRA regulatory commissioner was quoted by AP as saying at the Wednesday meeting. According to Bellona General Director and nuclear physicist Nils, Tepco is simply not up to the task of safely cleaning up Fukushima Daiichi – a task that is estimated to occupy at least the next 40 years. A government take-over of the cleanup and decommissioning work seems to be in the works. On Tuesday, the day before the NRA regulatory meeting, the Japan Daily Press reported that Toshimitsu Motegi Japan’s Minister of Economy, Trade and Industry (METI), offered that the government will take over cleanup efforts and allocate funding for long-term contaminated water management projects. But this may prove an awkward fit: METI oversaw Japan’s previous nuclear agency, the Nuclear and Industrial Safety Agency (NISA), which was just as complicit in spreading disinformation to the Japanese public and world public about the Fukushima crisis until it was replaced earlier this year by the NRA. METI’s relationship to nuclear regulation was also criticized as a conflict of interest, given the ministry’s mandate to support and spread nuclear power. The NRA revealed in interviews with Bellona earlier this year that the new agency is suffering from a public perception that it, too, it caught in the same crony industry-regulator symbiosis that made the Fukushima Daiichi disaster possible because of the number of former NISA staffers in its employ to help ease the regulatory transition.